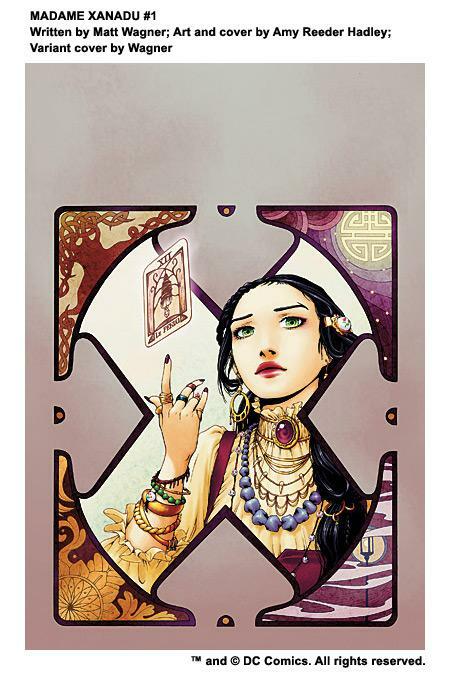 Do You Know The Origin Of Madame Xanadu ? [ENGLISH] Vertigo tells us: May 28, 2008 – Matt Wagner is a legend in the comic book industry. Best known for his original creations Grendel and Mage and his renowned run on Sandman Mystery Theater, Wagner has captivated readers for more than twenty years with epic stories of magic, myth and mystery. This June marks Wagner’s return to Vertigo, this time as a writer for a new ongoing series that reveals the origin of a cult favorite DC character and introduces readers to a dynamic new artist. MADAME XANADU (Vertigo | June 25, 2008 | 22 pages | $2.99) is a gothic love story between the mysterious Madame Xanadu and the Phantom Stranger. Their fraught, unconventional affair first blossoms in the final days of Camelot and develops over centuries, in the court of Kublai Khan, on the ships of Marco Polo, in London’s notorious Whitechapel district and on the streets of Greenwich Village. Collaborating with Wagner on MADAME XANADU is twenty-seven year-old artist Amy Reeder Hadley. If you haven’t already discovered her innovative and acclaimed work for TokyoPop, check out her website at http://www.tentopet.com/. MADAME XANADU signals the emergence of a fresh new look and Hadley’s breakout into the mainstream comics scene. Both Wagner and Hadley are available for interviews. A legendary writer. A cult favorite character. A thrilling new talent.